Citigroup is headquartered in New York City and conducts business as an investment banker in the banking sector alongside companies such as Goldman Sachs and JP Morgan. They also provide financial services to companies and individuals on the customer's behalf by offering mortgages and credit cards. The mortgage and credit card will be financially backed by another entity whereby an individual can get a Citibank credit card used as a Master Card. The key features that help set the boundaries for Citi in terms of business decisions are geared towards being a partner with their customers to help them find funds that will support their project. 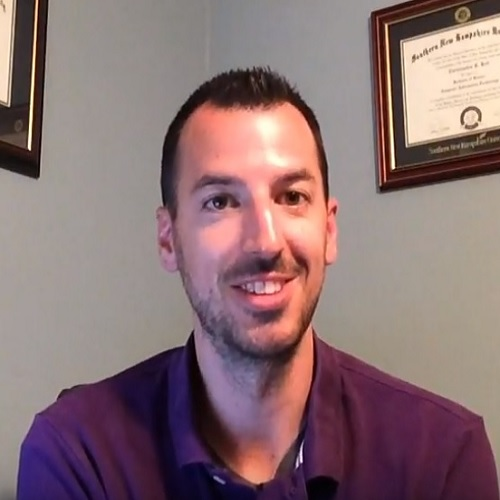 Similar to a real estate broker, Citi helps the customer find lending from another bank, helps discuss terms, helps with paperwork and also helps with legal preceding's when necessary. It takes the sales pitch out of the equation because Citi is really and truly there to help their customers get lending and favorable terms. According to Citi's website they have more than 16,000 offices in more than 140 countries, and were once named the biggest investment bank in the world based on total assets. Citi is organized and managed through its financial services offerings which are credit cards, banking, lending, investing and insurance. Citi started offering life and disability insurance when it merged with Traveler's Group in 1998. Since Citi also has 16,000 locations in 140 countries it forces their accounting statements to be split up by country. The currency exchange will affect how and where the profits are reinvested back into the company. Appendix 2 shows that Citi accounts for the revenues by region and business activity, which is 48% North America and 50% Global Consumer banking. However, in their 2015 annual report (Citi, 2015) their financial statements are broken up by region more than by business segment. The income statement for the last three years (Appendix 1) shows that the total revenue was between $67 and $69 Billion each year, yet the Net Income varied from $13B to $7B to $17B in order from 2013 to 2015. The dramatic differences lie in the SGA operating expenses which changed from $49B to $55B to $44B respectively. The net income dropped $6B while SGA went up $6B from 2013 to 2014. Then the net income rose to $17B when SGA went down $11B from 2014 to 2015. It appears Citi figured out that they either had too many employees or they were paying employees too much compared to the revenue they were making, but it also appears that they fixed the problem and increased net income dramatically in 2015. That's a good outlook for the upcoming years. 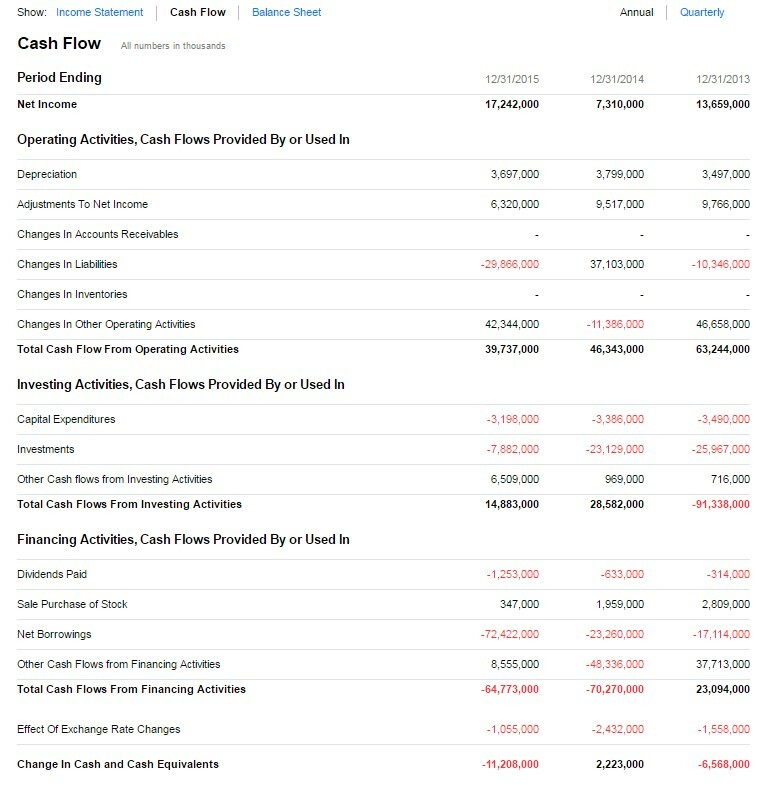 At first glance, Citi's cash flow statement (Appendix 3) appears to be poor when looking at the bottom line, however it's justified with the net borrowings line. From 2013 to 2015 Citi's change in cash was ($6.5B), $2.2B and ($11.2B), however they paid down debt each year of $17B, $23B and $72B which is a very good sign of things to come! It shows that Citi is paying down debt and it also says that their future finances look good enough to avoid borrowing money. 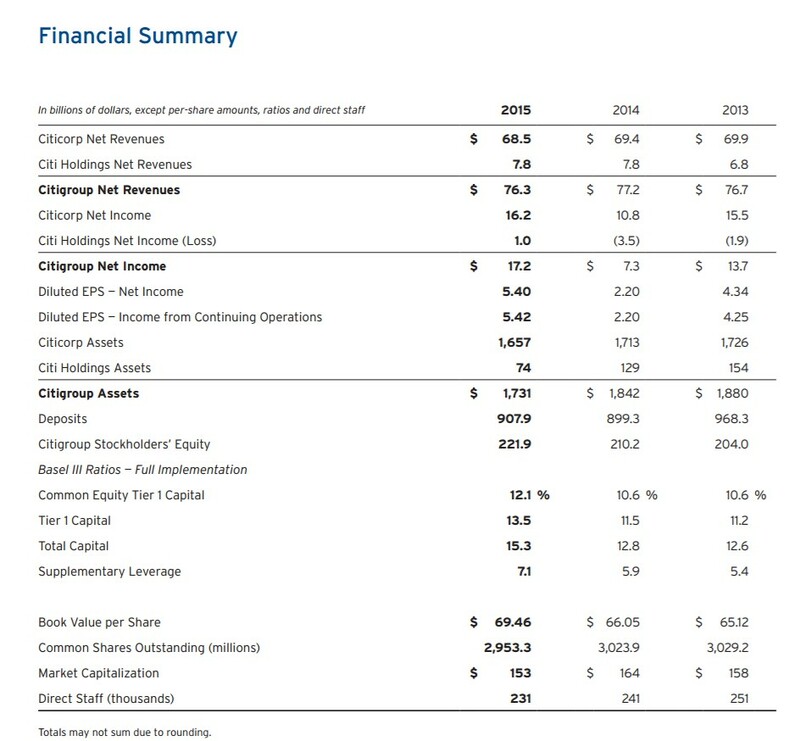 The investment activities section seems fair, as Citi has spent about 25% of its net income on capital expenditures (3 year average) and much more on investments. "Generally speaking, you don't want to see a company spend more than 50% of its net income on capital expenditures, as huge cash outflows in this area normally translate into less cash being used for things like buybacks and dividends that are good for shareholders. (Schauber, n.d.)"
Citi's underlying financial performance has been very good for the last three years and I believe it looks good going into the next few years as well. Citi set a personal record for net income in 2015 by specifically addressing the Sales, General and Administrative expense issue. While it's always sad to lay off employees there are tough decisions that CEOs need to make, and the quicker they act on these decisions the quicker the results make it to the financial statements. If Michael Corbat, CEO, had waited to make those changes then they would have had similar net income to 2014 of $7B which could have severely hurt their market price and investor base. It's also nice to see that a company has the available cash to pay down debt and Citi has dramatically increased the amount of debt they held over the last three years ($112B total). 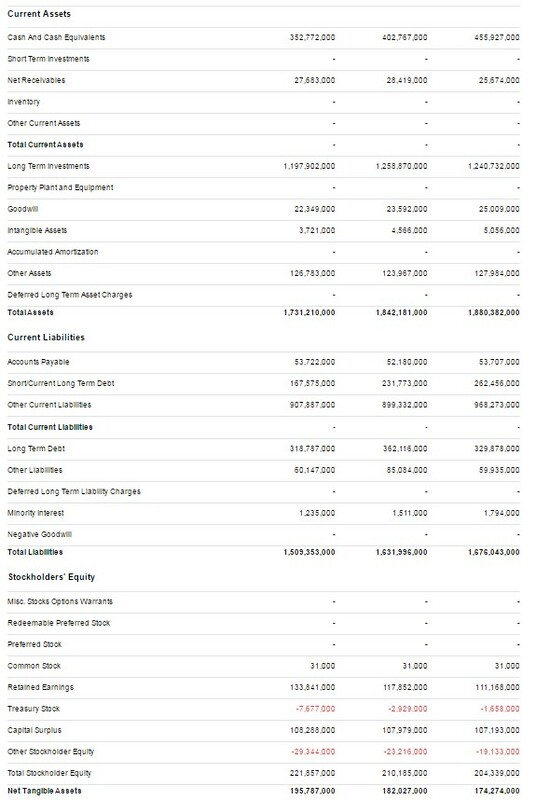 Citi is capitalized with $230B in total stockholder equity in 2015 based on $1.73T in assets and $1.5T in liabilities (Appendix 4). Over the last three years their assets and liabilities have both decreased but equity has increased by almost $18B since 2013. Their cash and cash equivalents have lowered by roughly $100B since 2013 but they also used $100B to pay down debt according to their cash flow net borrowings (Appendix 3). The current ratio is 33.7% which shows how quickly Citi can liquidate. It's more difficult to sell long term assets, so the ratio is based on current asset and liabilities. The debt/equity ratio is 6.8 which shows that the financial leverage used by Citi is 6.8 times their equity, and getting a bit high. I've read that DSO doesn't apply to banks or insurance companies. I believe Citi has enough cash, key people, technologies, reputation, and physical assets to maintain current operations and fuel future growth. I compared Citi's cash level to Goldman Sachs and JP Morgan and all three are close to 30% when compared to current liabilities. I also compared Citi's debt/equity ratio to GS and JPM which was 6.8, 8.9 and 8.5 respectively. I can't say that I know if Citi has the appropriate level of cash to fuel growth specifically, however I can compare the financial statements and ratios to competitive companies in the same industry in order to see if they are in the better or worse position, and it continues to show that Citi is even or better throughout my calculations. Citi already pays more than 1% in dividends, they paid more than $100 billion towards debt in the past 3 years and they hold more cash or cash equivalents in the bank (when compared as a percentage to liabilities) than their biggest competitors. The financial value of Citi is currently strong with a book value that's worth more than their total market value. The year end 2015 annual report (Appendix 5) shows that the book value, or total stockholder equity per share, was $69.46 while their stock price ranged from $40 to $60 throughout the same year. In other words, Citi's stock was trading at less than their liquidation value while also reporting positive net income (above $7 billion) for the last three years. Citi isn't the type of investment that a growth investor would seek out, however it is the type of investment that a value investor would seek out. "The market very often overestimates financial assets because of speculation. This makes it difficult to determine the proper value of a company. We believe that intrinsic value should be used to make an accurate assessment. (Ibrami, 2012)" Therefore, the market value tends to hover above and below the intrinsic value which gives Citi a strong chance of moving upward throughout the upcoming years. Citi's price-to-earnings ratio was 12 at the end of 2015 which is excellent considering the book value is higher than the market value before considering earnings. In conclusion, investor perceptions of the business's future look good in terms of two aspects. First, the market value needs to catch up to the book value and the overall intrinsic value (including the most recent $17 billion in net profit). 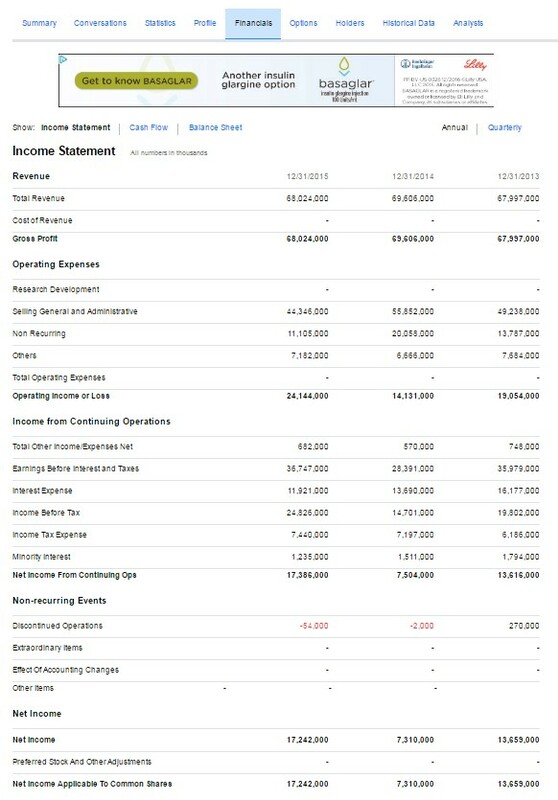 And second, Citi recently restructured its SGA expenses to increase net profits 2.5x, paid down a large amount of debt and has great cash flow to support future investment activities.